Born into the back streets of a small Canadian town, Rose battled incessantly with her practical and shrewd stepmother, Flo, who cowed her with tales of her own past and warnings of the dangerous world outside. But Rose was ambitious- she won a scholarship and left for Toronto where she married Patrick. She was his Beggar Maid, 'meek and voluptuous, with her shy white feet', and he was her knight, content to sit and adore her- Alice Munro's wonderful collection of stories reads like a novel following Rose's life as she moves away from her impoverished roots and forges her own path in the world. 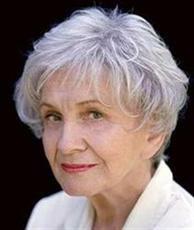 Alice Munro was born Alice Laidlaw in 1931, in Wingham, Ontario, Canada. She grew up near the Great Lakes that border the United States and Canada, in rural environs such as are featured in much of her early fiction. She attended public schools and was considered such a good student that she advanced a grade early on. She began writing fiction while in high school, and even wrote a novel during this time which she has said was derivative of Emily Bronte’s famous Wuthering Heights. She won a scholarship to attend the University of Western Ontario and spent two years there as an English major. It was there that she first published short stories, in a university publication. She left the university upon her marriage to James Munro, when the couple moved to British Columbia. During the 1950s, Munro continued to write while raising her first two daughters. She sold some of her stories to the Canadian Broadcasting Corporation for dramatization and radio shows. Munro had a third daughter in 1966, and then in 1968 her first collection of short stories, The Dance of the Happy Shades, was published. ‘‘Boys and Girls’’ is from this first collection of stories. Munro’s only novel was published in 1971. In 1974 a second collection of stories was published. With this third publication Munro established herself as a contemporary writer of note. Munro has seven published books to her credit, six of which are collections of short stories, making her a specialist in the short story genre. Most national literatures have writers who specialize in this way, another notable author being Anton Chekhov an early twentieth-century Russian writer famous for his short stories. It has often been said, therefore, that Munro is Canada’s Chekhov. Munro’s fiction is consistently favorably received by critics and the reading public alike, and she has won numerous awards for her writing. She has been invited to be Writer-in-Residence at various universities, including her alma mater, the University of Western Ontario (which conferred her an Honorary D.Litt. in 1976).